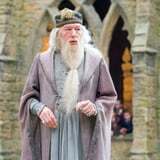 Dumbledore's father, Percival, went after the Muggles who harmed his daughter, earning him a sentence in Azkaban. His mother, Kendra, moved the family to Godric's Hollow and kept Ariana hidden from the wizarding world, due to her uncontrollable magic. One of Ariana's magical explosions resulted in Kendra's death, leaving Dumbledore to take care of his family right after he graduated Hogwarts and was planning to travel the world with his close friend and confidant, Gellert Grindelwald - the man with whom he planned a "new world order" between the wizarding and Muggle worlds.